Regular readers of the blog will be well aware of this one, and the depressing depths to which senior officers and councillors of Wirral Council have plummeted in order to draw a concealing veil across disability discrimination – as found by Mike Smith, former Chair of the Disability Committee of the UK’s Equality and Human Rights Commission. …because, er… Wirral don’t have one. So once over that low hurdle, one of the established Wirral governance trainer’s next awkward tasks was to appoint a fearless and impartial legal representative. Law firm DLA Piper soon stepped up to the mark and, fully aware of their remit, pored over the evidence supplied and made a decision in the public interest. …although two senior council officers from Social Services spent 9 long years plundering £736,756.97 (but most likely a helluva lot more) from at least 16, but an undeclared greater number of learning disabled tenants of supported living establishments across Wirral. This unlawful and calculated act caused immense suffering and hardship. Well it would, wouldn’t it? I believe some of the victims still await the return of their money more than 3 years later. To sum up, a local authority, in 21st century Britain, with a statutory obligation to look out for and protect vulnerable persons within its jurisdiction, instead actually ganged up on them, knowing there’d be no scrutiny from pisspoor councillors, and stole a mammoth six figure sum of money from their bank accounts…. yet still, a law firm (and later Judge Christopher Hughes OBE of the First Tier Information Tribunal) appear to have given the abusive council the thumbs up. Former Wirral social worker Martin Morton, now without a career and unemployed, blew the whistle on a number of acts of malpractice which verged on the criminal, including this one – and this was the headlining story in the newspapers at the time – the story which stuck fast in the hearts and minds of the local public. Here’s the history of this issue, starting with my approach to Angela Eagle. Now, let’s fast forward to where it is today. As you can see, it was appealed to the ICO and a Decision Notice arrived recently dated 3rd October 2013, 20 months after the original request was lodged. The ICO found positively, and in favour of the public interest. Wirral Council then had 35 days – from 3rd October 2013 – to supply the information I’d requested (correspondence between the council and the lawyers), which was wrongly withheld under Section 41. The council had withdrawn their reliance on a Section 42 exemption, and used Section 41 wrongly (which I’d realised very early on). Yesterday, this deadline arrived. Upon ringing the Law Department and speaking to a Wirral Solicitor, I discovered that they’re appealing against the ICO finding. HOW can this latest lurch to the ££expensive services of m’learned friends be a sign that the penny’s dropped, and they’re finally facing up to their own scandalous malpractice? If they’d actually learned any lessons, they’d be throwing open the books. But no, here they are once again, slamming down the shutters and closing up shop, adding insult to injury, just like the bad old days. 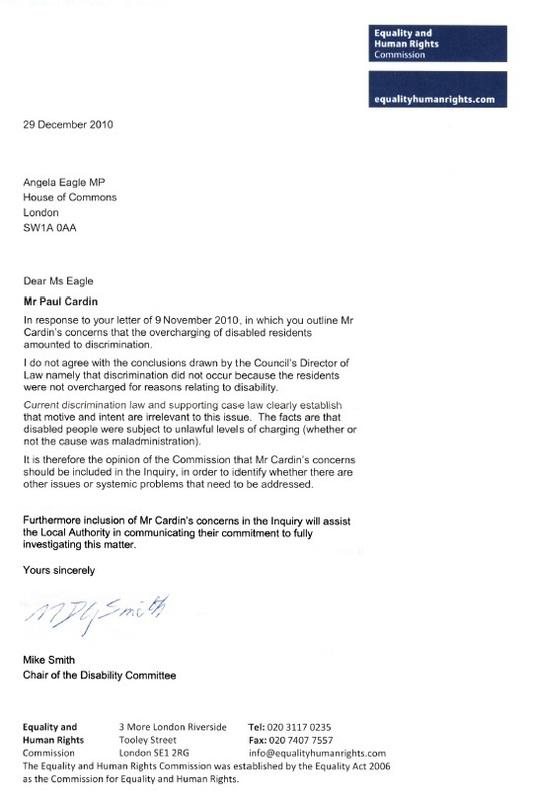 This entry was posted in FoI Requests, General and tagged Angela Eagle, Anna Klonowski, Bill Norman, Decision Notice, Disability Discrimination, DLA Piper, EHRC, Equality and Human Rights Commission, First Tier Information Tribunal, Judge Christopher Hughes OBE, Martin Morton, Mike Smith, Paul Cardin. Bookmark the permalink.